American Airlines has one of the world’s most toxic management-labor relationships; one that can’t be solved by bankruptcy restructuring or other window dressing. A merger between bankrupt American Airlines and US Airways may not be inevitable, but something has to change at the Fort Worth carrier if it is going to survive, industry analysts say. In its ninth month of bankruptcy reorganization, American parent AMR Corp. is evaluating its options, which include merging with another carrier — US Airways, JetBlue Airways, Alaska Airlines, Virgin America and Frontier Airlines are potential candidates — or flying as a stand-alone carrier. American Airlines baggage belt at Dallas-Fort Worth. Photo by Grant Wickes. Although American CEO Tom Horton believes the company can slash its legacy airline costs in bankruptcy and emerge to compete successfully with larger rivals United Airlines and Delta Air Lines, many who follow the industry are skeptical. 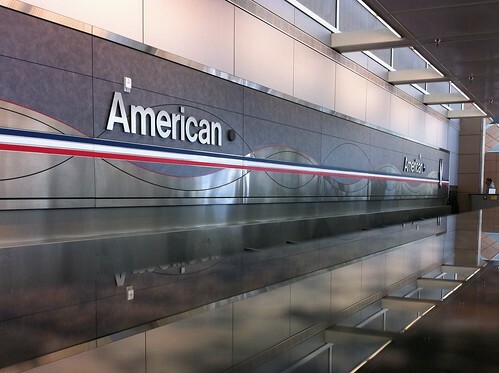 Jamie Baker, who follows AMR for J.P. Morgan Chase & Co., said a tie-up with US Airways would provide AMR with US Airways’ Philadelphia and Charlotte, N.C., hubs and 33 new eastern U.S. cities that the Fort Worth carrier doesn’t presently serve. “We are underwhelmed with AMR’s stand-alone restructuring plan, insofar as it fails to adequately address the decade-long marginalization of its domestic network,” Baker said. “AMR has fallen to fourth place in the largest non-hub eastern and western markets, though (it) maintains a number two rank in the west. “Delta and United networks offer more to corporate travelers. We examined several smaller cities east of the Mississippi and in most examples found Delta and United offer several hub options. In AMR’s case, well, one can easily get to Chicago. For many, this is adequate if headed to California but insufficient if headed to most points in Asia, Europe or Latin America. While AMR hopes to dominate local hub markets, feed to/from said hubs appears lacking in our view. Bigger is better in the airline industry today, analysts say. The bigger the route network, the more extensive the partnerships in international alliances, the more likely the carrier will win the loyalty of business and leisure travelers, analysts say. “American, as big as it is, would be a distant number three,” Kauffman said, “and it has lost some of its edge in frequencies, destinations and quality of fleet. Unless you have a niche no one else does, you need a network for the business traveler and the leisure traveler. Analysts question whether Horton’s “cornerstone” strategy — emphasizing feed and increased flights at its Dallas/Fort Worth, Chicago, New York, Miami and Los Angeles hubs as gateways to lucrative international travel — will be sufficient to increase revenue by $1 billion a year. The major challenge at AMR is internal, in the view of some industry observers. AMR and American have the most bitter labor/management relations in the airline business, industry officials say. Most observers believe employee morale turned sour after the wage and benefit concessions of 2003. American’s 50,000 mechanics, pilots and flight attendants were persuaded under threat of an imminent bankruptcy filing in 2003 to accept $1.6 billion a year in wage and benefit cuts. For American workers, including 5,600 mechanics and related work groups at American’s Tulsa maintenance base, that meant nearly 20 percent wage cuts, less vacation time and more weekend and holiday work. American management sold the concessions with slogans such as “Shared sacrifices, shared rewards,” implying that down the road a healthier company would share equally the fruits of prosperity. As it turned out, both the sacrifices and the rewards were one-sided. While American workers struggled with longer hours for less pay, management was rewarded with millions of dollars a year in bonuses. The effects of the concessions and the management bonuses were compounded by protracted contract negotiations that began in 2006. The 2003 contracts became amendable in 2008, but management couldn’t reach agreements with the unions, and the process ended with AMR’s bankruptcy filing in November. American’s workers are an unhappy crew, employees and observers said. Those who believe a merger is American’s best long-term strategy say it would strengthen American where it is weakest and cure the labor/management rift, assuming a new management team would take control. AMR executives, in collaboration with the creditors committee in its bankruptcy case, has developed a non-disclosure agreement the company is sending to US Airways and other potential merger partners. The agreement will allow the parties access to confidential information to objectively evaluate strategic alternatives, AMR executives said. Although he thinks a US Airways/AMR merger is most logical, Jake Dollarhide, CEO of Longbow Asset Management Co. in Tulsa, said he is intrigued by a potential marriage between AMR and Virgin America. But it is US Airways that many analysts return to after considering alternatives. “US Airways has the small town (East Coast and Midwest) network that can bring in (passenger) feed,” Sterne Agee’s Kauffman said. “Both carriers would face a better future as a consolidated entity. US Airways could bring traffic and flow back to an American network that has lost traffic and flow. Herbst, the industry analyst, said the revenue of United and Delta are now 45 percent to 60 percent larger than American’s. “Combining the revenues of American and US Airways would move the merged carriers to the top of the largest airline in the world list,” Herbst said. “The industry has changed so much because of consolidation that there is no way a small carrier, which American has become, can compete with Delta and United.